You've heard it time and time again: practice makes perfect. And our pros couldn't agree more. Quantum designers and pros have been very active with the new C&C30 class, reminding us of the importance of practice. Below, Quantum's Dave Flynn talks about his tips for practicing and how to get the most out of it. C&C 30s at their best - Photo by Onne van der Wal. 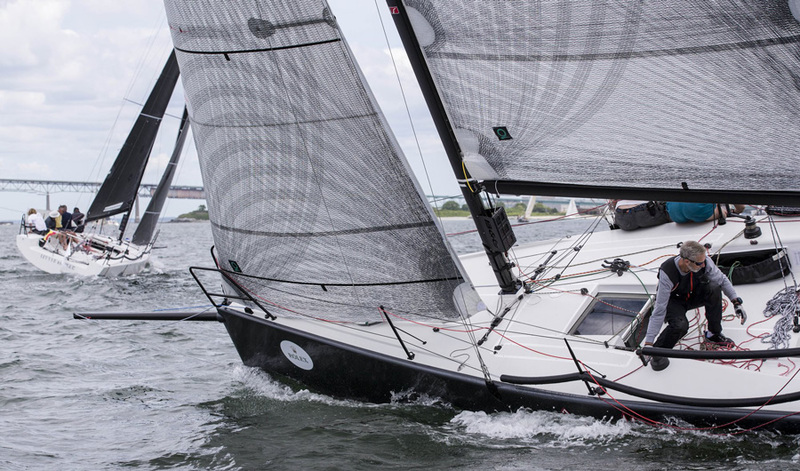 This past season, Quantum Sails sponsored a C&C 30 clinic before the fall one design regatta in Annapolis. With nine boats, it was one of the biggest gatherings for this new class, and the regatta was a trial-by-fire event for everyone. With all boats experiencing the same learning curve, the clinic provided a great opportunity to learn and share. It also reminded me of some important lessons that are taken for granted at higher racing levels, but from which all racers could benefit: You have to practice. I know this sounds absurdly simplistic, but sailing is a sport, and, like all other sports, it takes practice. We can’t expect to tack, jibe, and douse spinnakers effectively without working on it first. Yet most of us expect to show up and have everything work. At a minimum, get to the starting area an hour or more early so you can go for a full beat –spinnaker set, a series of jibes, and a racing take-down. If you really want to improve, schedule a non-racing weekend to sail with your team. If you’re going to a major event (at whatever level is “major” for you), show up a couple of days early to get your boat fully sorted out and your crew up to speed. Make sure the whole crew is there and in the proper gear. Have the boat fully rigged and ready to go. Then leave the dock at a defined time – don’t lollygag. Get the boat set for upwind, and sail in a straight line for a while to get everyone settled in. Next work on tacks, going through a half dozen or so until the ballet is smooth. Find a weather and leeward mark (it’s important to have real marks so the crew can picture what’s coming and prepare accordingly – setting or dousing a spinnaker at an imaginary mark doesn’t work). Start doing laps. Give yourself enough room so that you can do 4-5 jibes per run. Too long and the upwind legs will become a slog. Often, you can start with a longer windward-leeward to get organized then shorten it to increase the intensity. If things go badly with a maneuver, stop and get reorganized. It is not a bad idea to take a break after a couple of laps to review what’s working and what needs fixing. A high-intensity, focused practice that has a defined beginning and end is better than a long drawn out session with no clear limits or defined goals. The only way to effectively work on boat speed is with a training partner. You always seem fast when sailing by yourself. A partner will help you see your actual results and can be one of your most valuable assets at a regatta. Use a radio or signals to communicate so you can plan your tacks, agree on which marks to use, etc. To work on upwind speed, a proper lineup is key. You need to be no more than 2-3 boat lengths apart with the bows even (further apart and there will be too many variables). If one boat is clearly gaining and getting into too much separation, slow down and re-group. After sailing for a while, switch sides (leeward boat should become the windward boat). Don’t forget to practice sailing laps once you are comfortable with upwind setup. Doing laps with a partner will help your mechanics by introducing a higher level of intensity. Your partner can be one of your most valuable assets at a regatta. Plan to go out for each day’s racing at the same time. Sail together for a half hour or so upwind in the course area to work on speed, then set spinnakers and work on a downwind leg. If you have time, you can add a second beat and each boat can take a side. That will give tacticians a good clue as to which side is favored. When you get back to the dock at the end of the day, compare notes on rig settings, trim, and tactical decisions. Both teams will be better at the end of the regatta, and the camaraderie is a plus. One of the most difficult maneuvers to get right is the leeward mark turn from downwind to upwind. It is a big turn, nearly 180 degrees, and demands smooth coordination between mechanics (taking the spinnaker down) and the speed team (driver and trimmers). The hard part is the rate of turn and matching trim to turn. The goal is the classic “in wide out close” turn that starts wide and ends up with the boat arriving at a full, upwind angle as the bow passes the mark. You can practice this technique by yourself. First, take the spinnaker out of the equation. Approach the downwind mark on broad reach (true wind angle 140-150 for realism) with only the mainsail and jib. Practice making a smooth in wide out close turn with coordinated trim – don’t get ahead on the trim (trimmers love to cheat and pull sails in early). As you pass the mark, take a look back and see how close you got to full upwind trim and angle. Sail upwind for a minute or so, tack, bear away, and repeat. Five to seven repetitions will give drivers and trimmers a good sense of how wide, when to start the turn, and how fast to trim. The key to a good start is being on time with speed, but the real measure of success is if you can hold the lane for 2-3 minutes on starboard without being forced to tack by the boats on either side. Holding a lane is tricky. A good way to practice is to have boats line up approximately two boat lengths apart on a beam reach. At an agreed upon signal, turn up to close hauled. Again, practice a smooth turn with coordinated trim up to close hauled then settle in for three minutes, working on holding height and fore and aft positions on boats above and below. This simulates a good, even start, and allows you to focus on speed and height without having to battle for position. Starting is the hardest part of the game, and perhaps the most important. It’s also the most difficult to practice, which is why sailors who have come up through collegiate programs have a big advantage – they’ve literally practiced hundreds of starts. That’s why the highlight of the C&C 30 clinic was an extended series of rolling practice starts. Timing varies depending on wind conditions, but five-minute intervals usually work well. Start upwind for a minute or two then bear off back to the starting areas to do it again. In one hour you can get twelve starts in. There is no substitute for practice starts. All it takes is a group of boats, a committee boat, and a mark. It’s not as difficult to organize as you might think, and your team will come away with dramatically improved techniques and confidence.